You start off my making the yeasted dough, then pounding out a crap ton of butter with a rolling pin, then laminating the butter with the dough (i.e. wrapping the dough around the butter completely, as if the butter is a sheet of paper and the dough is the clear plastic), then you roll the whole thing out into a long strip, then fold it into thirds—like a letter, then rinse and repeat the rolling and folding again and again and again. All the while, you're shoving the dough into the fridge/freezer after each step and giving it a good chill for anywhere between 30 minutes to 2 hours. Then, and only then, can you roll the dough out one last time, cut triangles out of it, stuff it with any filling you'd like, roll it up into crescents, left it proof for 1 to 2 hours, and bake. Whew, FINALLY. Are you running in the other direction now? No? Gooood. 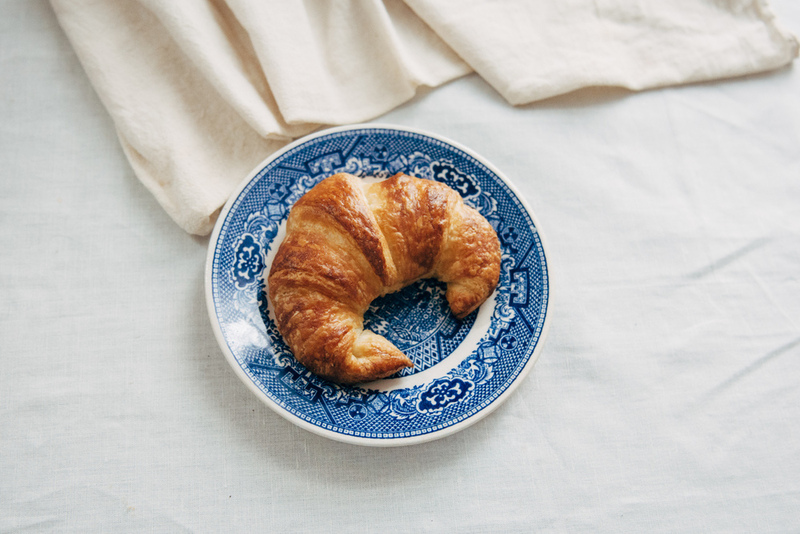 Because what comes out of your oven at the very end will be the flakiest and freshest croissants you've ever eaten. 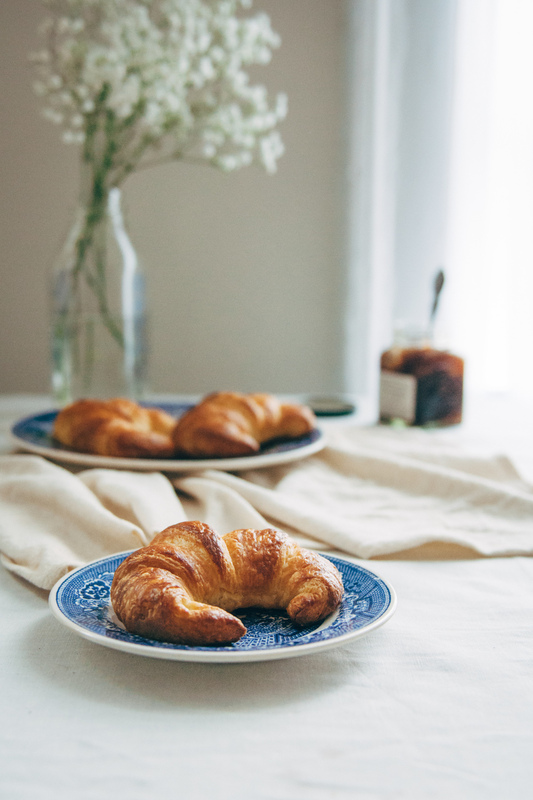 Unless you've had freshly baked croissants before...but I'll pretend like you haven't. I ate six of them in one day the first time I made them. Seriously. No joke. ATK suggests using a European style butter rather than American since it has a slightly higher fat content. I would suggest the same. You only have to do this for the butter block that you layer with the dough. The melted butter that goes into the dough itself can be of any variety. The original ATK recipe calls for instant yeast, but I prefer active dry yeast since you can tell right off the bat if your yeast is expired as it won't foam up when you try to activate it, in which case you should start over and probably get new yeast. If you prefer instant yeast you can omit the warm water, increase the amount of milk by 1/4 cup, warm the milk to 90 degrees F, then add the yeast right before the adding the dry ingredients. Yields 16 medium-large or 24 medium-small croissants. In the bowl of a stand mixer, sprinkle yeast over a mixture of the warmed water and 1/2 tsp sugar. Give it a good stir, and let it sit for 10 minutes until frothy/foamy. In the meantime, sift together 4 & 1/4 cups flour, the remaining sugar, and salt. Add milk and butter to the yeast and give it a good stir. Add dry ingredients and mix with the dough hook on low for 2 to 3 minutes. If the dough is not clearing the sides of the bowl, give it a good scrape down and add more flour a tablespoon or two at a time. Make sure not to overwork the dough because you don't want too much gluten to form at this stage. Once the dough comes together, turn it onto a lightly floured surface and give it a few kneads with your hand. It should be soft, supple, and only slightly sticky. Transfer to a clean bowl, cover, and let rise for 30 minutes. Transfer dough to a parchment paper lined baking sheet and press it into a rough 6 by 8 inch rectangle. Cover with plastic wrap and chill in the refrigerator for at least 1 hour. In the meantime, prepare the butter. 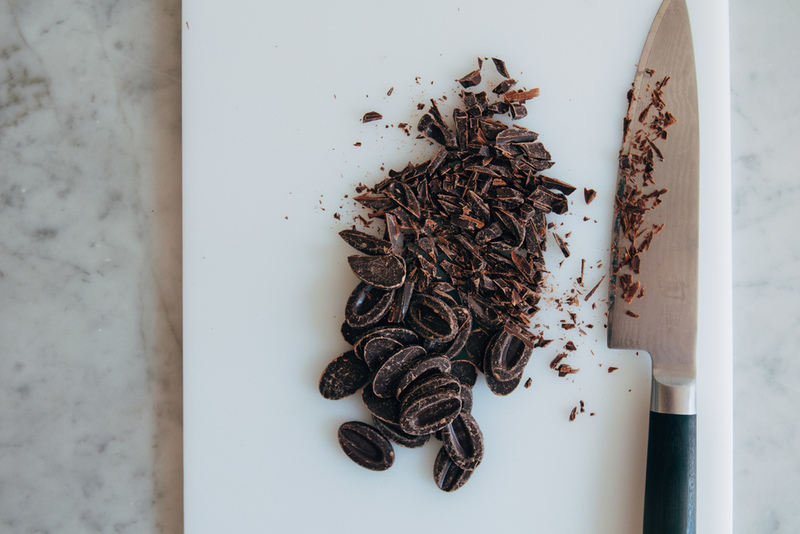 Take a sheet of parchment paper that is 24 inches long by 16 inches wide. It doesn't have to be precisely those dimensions, just something close to it. Fold the paper in half so that it is now 12 inches long. Then fold over each of the three open sides so you have a closed packet that is 8 by 8 inches. 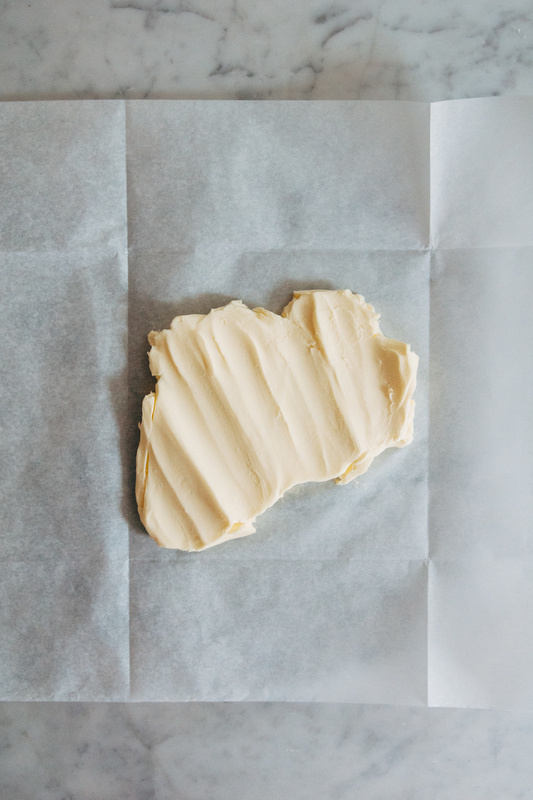 This will be the template you'll use to roll the butter into a perfect square. On a clean counter with a rolling pin, beat the living daylights out of your butter to flatten it and make it more malleable. Open up the parchment paper, and using a pastry scraper, transfer the butter to one of the two 8 by 8 squares. Re-fold the parchment paper to form a packet again. Flip packet so that all the seams are face-down. Roll out the butter so that it fills the entire packet, making sure it gets into all four corners. Place butter packet in the fridge to firm up. After the dough has been chilling in the fridge for an hour, transfer it to the freezer for 30 minutes. Remove dough from freezer and transfer it to a well floured counter. Roll it into an 8 by 16 inch rectangle (mine ended up being more like a long oval). Unwrap butter, place it in the middle of the rectangle, and fold the sides over. Pinch the seam shut so that the butter is fully covered. You might have to wiggle and stretch the dough a little, which is fine, just make sure no butter is peeking out. Using the rolling pin, press firmly on the two open ends to seal the butter and dough together. Note: I have tried doing both three and four folds of the dough, and I find that the croissants have a slightly nicer texture with four. However, the difference is marginal at best, so you can definitely get by with three if you need to save some time. 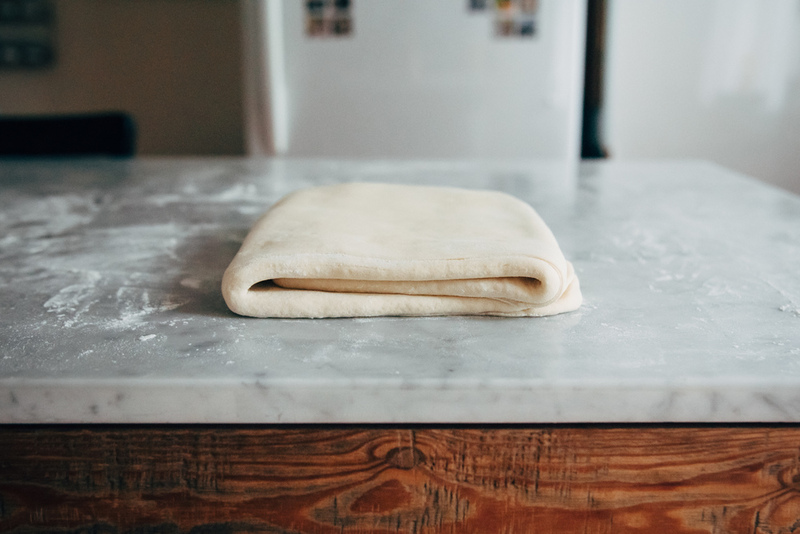 After the last fold, transfer your dough to a baking sheet once again, cover tightly with plastic wrap, and refrigerate for at least 2 hours or overnight. After a long refrigeration, place dough in the freezer once more for 30 minutes. Transfer to a floured counter and roll the dough out into a 16 by 22 inch rectangle. Cut the dough in half so you now have two 8 by 22 inch rectangles. 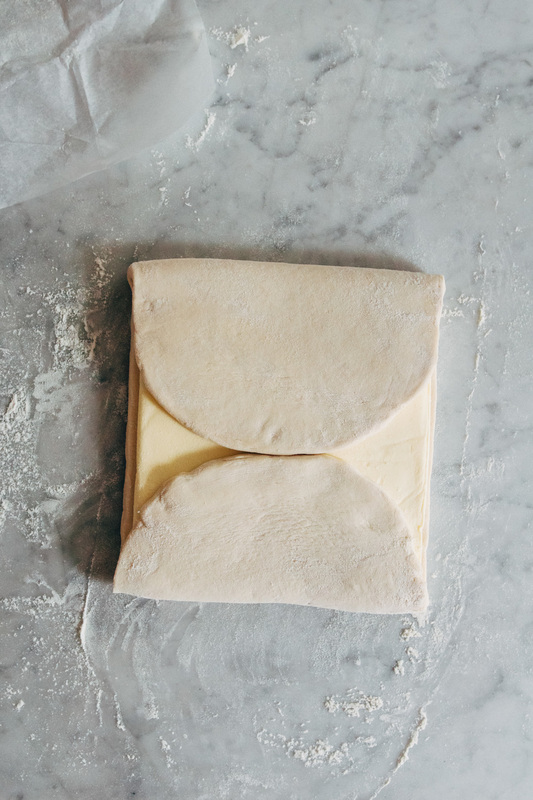 Using a ruler and knife, make knicks at five inch intervals along the bottom edge of each sheet of dough. Do the same for the top edge, but offset each knick by 2 & 1/2 inches. Cut out triangles using a pizza/pasta/pastry cutter or knife by connecting the knicks you just made. You should end up with 16 triangles plus some trim on the ends. Note: for smaller croissants, roll the dough into a 16 by 20 inch rectangle, cut in half, then make knicks at 3 inch intervals. 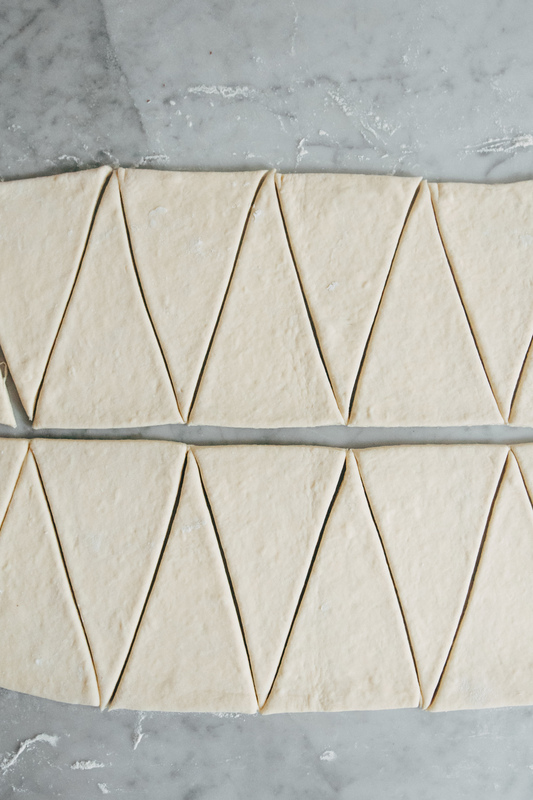 To roll crescents, make a 3/4 inch cut on the bottom (the short side) of the triangle, and stretch it out slightly. This will keep the center of the croissants from being too puffy and help you form that crescent shape. Then, stretch the dough down the length of the triangle so that it kind of looks like the Tesla Motors symbol (or an elephant head, according to Phillip). Roll the triangles toward the tip and stop when the point of the dough is just tucked underneath the rest of it. Bend the ends toward each other to form a crescent. Note: if you are filling the croissants, place one to two tablespoons of filling on the dough before rolling. 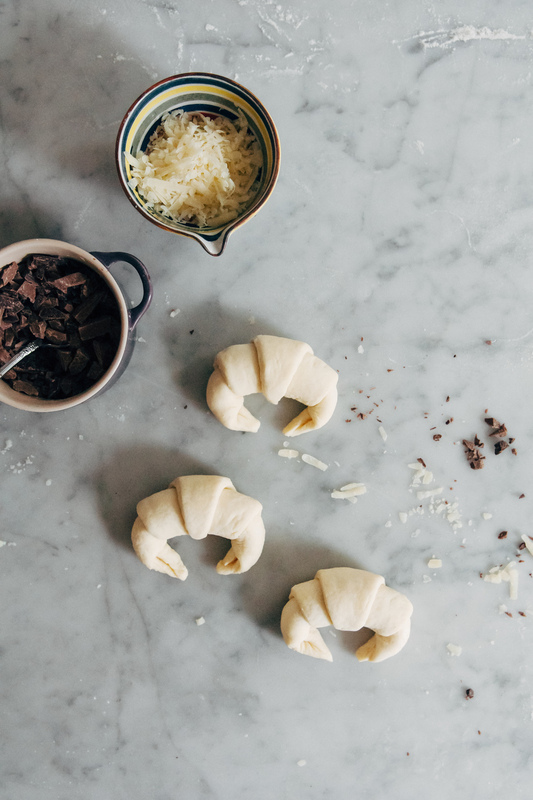 To proof, transfer the crescents to parchment paper lined baking sheets (I do 6 croissants per sheet, bake no more than 2 sheets at a time, and freeze the rest for another day). Cover with plastic wrap and let sit for 1 to 2 hours, until nearly doubled in size. 20 minutes before baking, adjust your oven racks to the middle and upper positions and preheat oven to 400 degrees F. Whisk 1 egg with 1 tsp water and brush the croissants with the egg wash. Bake croissants for 10 minutes then switch the positions of the sheets. Bake for another 8 to 10 minutes until golden brown. Remove from oven, transfer to a cooling rack and let cool for at least 15 minutes. Enjoy with your favorite jam, as a sandwich, or simply plain!